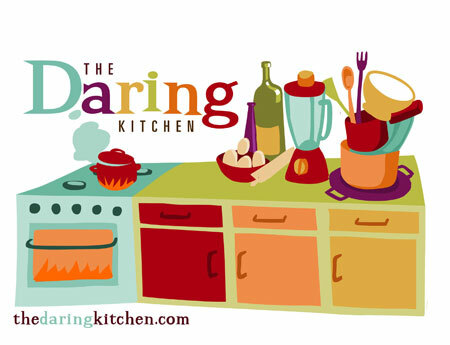 The August 2009 Daring Bakers’ challenge was hosted by Angela of A Spoonful of Sugar and Lorraine of Not Quite Nigella. 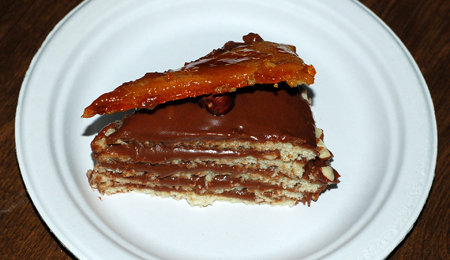 They chose the spectacular Dobos Torte based on a recipe from Rick Rodgers’ cookbook Kaffeehaus: Exquisite Desserts from the Classic Cafés of Vienna, Budapest, and Prague . I was excited about this one at first because of its source, a book that has been on my wishlist for some time. It is a classic Austrian pastry composed of five airy layers of vanilla sponge enrobed in dark chocolate buttercream and topped with a caramel-glazed cake layer, both for decoration and for the more practical purpose of prolonging storage at room temperature. I’ve made variations of all of these elements during my tenure as a Daring Baker, so the part of the recipe that most concerned me was finding time to make it, now that I’ve got a fully-fledged toddler in the house. The cake batter was a very simple one: egg yolks beaten until pale with sugar and vanilla, with whipped egg white and cake flour gently folded in. I had no cake flour, so I subbed in a mixture of sifted all-purpose flour and cornstarch. 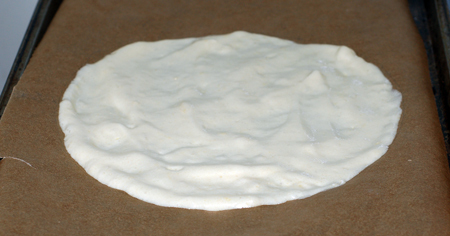 The batter is then spread in a 9″ circle on parchment, and baked just for a few minutes until golden. I used a rotation of 3 sheet pans, and the cakes were all cooling inside half an hour. 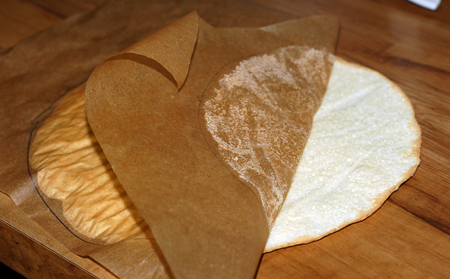 After cooling, the cakes had to be carefully peeled off the parchment and trimmed into 8″ rounds. I was grateful for this instruction because the edges of my cakes were less than precise; then again, I freehanded the trimming with my kitchen shears, so they still probably didn’t quite match up at the end. Next, I whipped up the buttercream, eggs foamed up with sugar and heated with dark chocolate over a bain marie. I used Valrhona chocolate and ordinary granulated sugar, rather than the caster sugar called for. Although I cooled my buttercream base in the fridge and thoroughly softened my butter, I ended up with some pretty soupy frosting, so I decided to refrigerate it overnight rather than using it immediately. I suspect that the extra-large eggs I used were a major contributor to the consistency; perhaps adding more butter would have made a difference. Before calling it a night, I went ahead and made the caramel for the topping. This recipe uses both water and lemon juice, and made an incredibly foamy caramel as it cooked down. 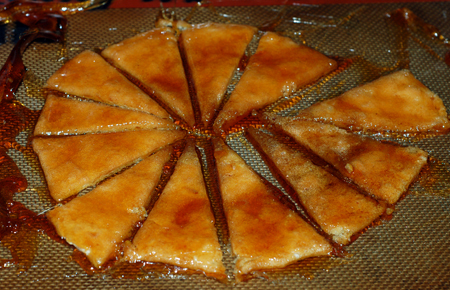 I cut one cake layer into wedges and laid them in a circle on my silpat, and then poured the caramel over. One of the wedges was folded in half by the molten sugar, so I had to gingerly slide it back into position, then begin the somewhat frustrating process of trying to push the caramel out from around and between the wedges of cake. I did what I could until the caramel cooled, and then trimmed the edges a bit more the next day with my kitchen trimmers, but they still didn’t look as clean as I would have liked. The buttercream, however, fared much better after a night in the fridge. It was still spreadable but not runny, and I was able to assemble my cake. I’ll be storing it in the refrigerator, though, because I suspect that the frosting would melt off if I left it out. 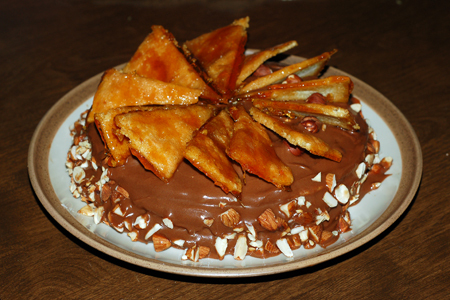 The finished Dobos Torte was tasty, but not spectacular for the amount of effort I put into it. It was pretty sweet, but the almond garnish helped counteract that a bit. I actually didn’t care for the caramel topping at all, mostly because I found the lemon flavor overpowering and ill-suited for the chocolate, but also because it made the cake kind of hard to eat. It did give the cake a beautiful, distinctive look, though. All in all, this was a fun cake to try out, and I appreciate its traditional origins, but I would probably go with another recipe if I really wanted to wow guests. Many thanks to our hosts; the recipe can be found here, and be sure to check out the hundreds of fabulous Dobos Tortes on the Daring Bakers blogroll! Great job! I loved the buttercream, but agree with you on the caramel! Your torte looks great and the icing looks especially creamy and delectable! I thought this was a bit labor intensive which must have been really tricky for you with a toddler in the house! Good job on the challenge! I completely agree about the caramel part, the lemon is weird and it’s hard to eat. But the rest is yummy! Great job! Turned out beautiful! So much so that you might restore my cravings for chocolate sooner than I thought!! Well done! I think your cake and the caramel wedges turned out lovely. I totally agree with you about the lemon in the caramel, hence why I omitted it. You did a fantastic job all around and it looks yummy!